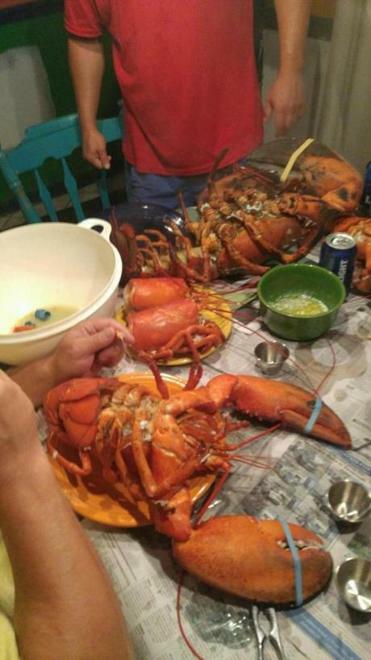 After photos of 15-pound lobster went viral, Christopher Stracuzza served it up for a feast with friends. The owner of a massive lobster that became an Internet sensation this week — after a picture of it was shared on social media by Transportation Security Administration officials — is steaming mad that his precious cargo was taken out of its container and flaunted to the public. Christopher Stracuzza was traveling Sunday from Boston to Georgia when he checked a cooler, containing a roughly 15-pound crustacean and at least a dozen smaller lobsters, with security. During the screening, the TSA went through the marked container and later shared an image of the largest lobster on Twitter. The photo showed an agent holding up the lobster by its claws, a smirk on the officer’s face. “TSA officers are skilled at screening all sorts of items in checked baggage . . . including this 20+ pound lobster at Boston Logan,” a TSA spokesman wrote on Twitter, estimating the crustacean’s weight. But Stracuzza, who was bringing the lobsters home to share with friends for an annual feast, said the move invaded his privacy and put the lobsters at risk of dying, since they had been packaged in such a way that they could stay alive and fresh. According to TSA regulations, live lobsters are allowed through security, but they must be transported in a clear, plastic, spill-proof container. Stracuzza’s cooler was not see-through and was sealed with tape. The words “Live Lobster!” were written in black on the top of the container in two places. On occasion, TSA officers open checked luggage to screen the contents. The agency sometimes shares images on social media of items found in people’s luggage to “provide helpful travel tips and to better inform the traveling public about [the] TSA’s mission,” spokesman Michael McCarthy said in a statement. The agency also often blogs about its findings if they are unusual or have been confiscated. “At no point does TSA reveal passenger-specific information,” McCarthy emphasized. Stracuzza said he learned from a friend on Monday, one day after arriving at his destination and cooking the lobsters, that his luggage had become A topic of Internet discussion. “I got a call and he was like, ‘Dude, your lobster is all over the Internet,’ ” Stracuzza said. Stracuzza had purchased the haul from a fish market while on a trip to Connecticut with his 6-year-old son. He spent about $700 total on the lobsters. He said it may “sound stupid to a lot of people” that he’s coming forward to complain about the TSA’s decision to post the picture online, but the incident disturbed him. He’s more upset about how his costly meal was handled. A spokesman said the TSA will respond directly to Stracuzza’s complaint about sharing the photo. Stracuzza said that as of Wednesday morning, he had not heard from the agency. As for how the massive lobster tasted?